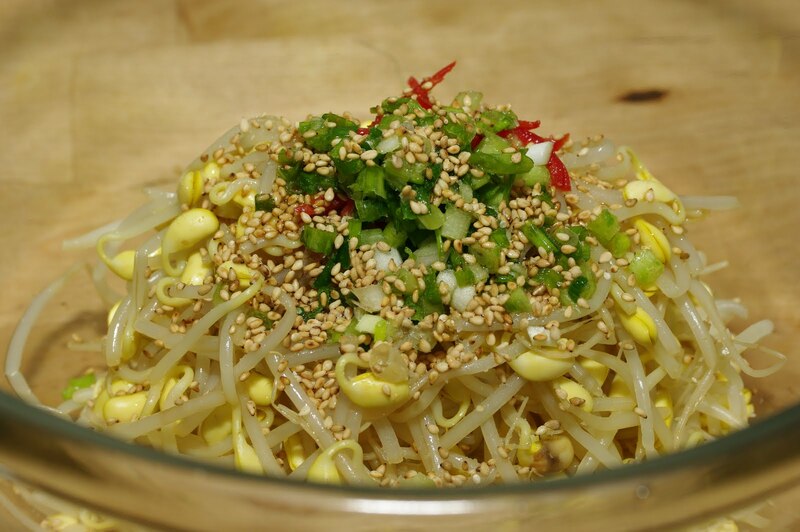 Bean sprout (콩나물, kong-na-mul) is perhaps the most common side dish you see at Korean restaurant or any Korean home dinner table. They are cheap, healthy, and very easy to prepare. This dish can go with any meal. Don’t limit on just Korean dinner only. Bring on Chinese, Japanese, Thai, Vietnamese or Ethiopian. These skinny yellow guys are sure to please you. They are full of Vitamin A and C plus protein. What vegetable can you get a good amount of Protein? I can’t think of any right now. 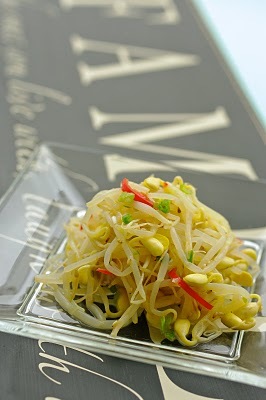 So grab a bag of these sprouts from your grocery store and let’s eat healthy. These bean sprouts are coming from soy bean. They are actually easy to grow at home. All you need is soy bean and water. Unlike your hubby they don’t require your TLC. 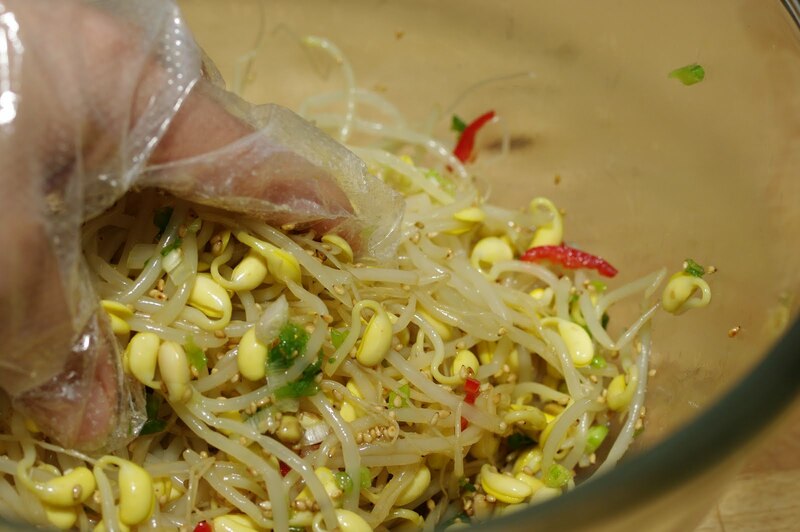 Anyway Clean these sprouts by removing the head skin. I leave tails on them because I am lazy. Here are the crew members. Bean sprouts, sea salt, sesame seeds, sesame oil, garlic powder, green onion, and some sliced red chili(optional). First place cleaned bean sprouts in a pot. Pour 1/4 cup of water. You heard me right, 1/4 cup of water! You only need a little water to cook them to retain their precious Vitamins. Besides they will get cooked by their own moisture. Smart! Cover the lid. Turn the heat to medium. Set you timer to 8 minutes. When you see the steam comes out from the pot, turn the heat to low and wait until the timer alarms you. Remember, DO NOT OPEN THE LID! If you pick on them by opening the lid you will get unpleasant fish like smell from these guys. You don’t want that. Just leave them alone! Now the sprouts are done. 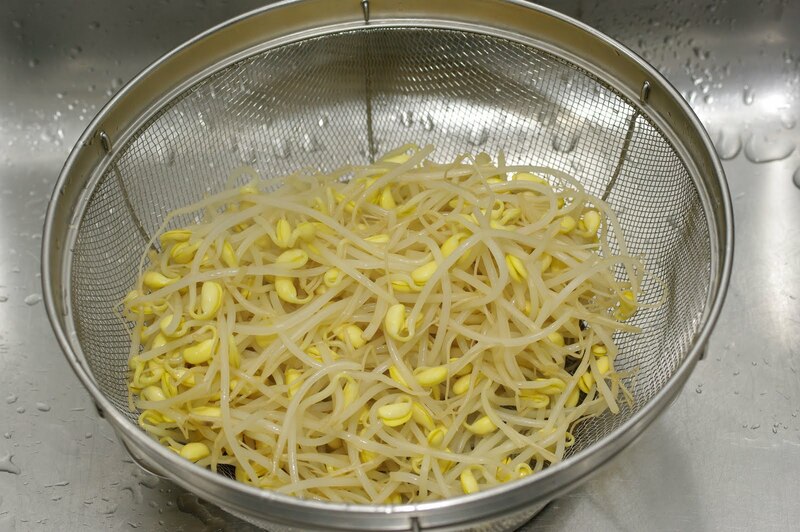 Transfer them to strainer and strain all the liquid. Do not rinse. Just let them cool down for 2 minutes. Looks great. Soft yet crunch, the way I like it. Place the sprouts in a mixing bowl and add sea salt, garlic powder, sesame oil, sesame seeds, chopped green onions, and some red chili for a kick and color if you like. 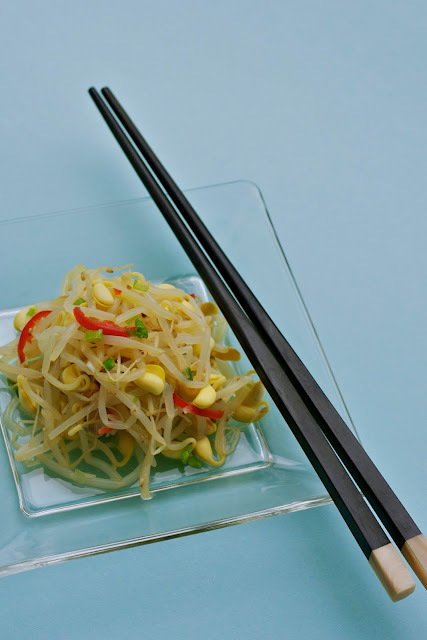 I sometimes use fish sauce instead of salt. It gives more pungent flavor. Toss them well. Adjust your seasoning as you like. You might need more salt. 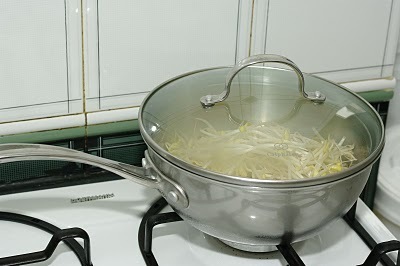 Here is a tip to toss veges in Korean cooking. You gently squeeze them like massaging motion, as you mix them around. That way all the seasoning can soaked in to the vegetable. You gotta use your hand to do that. Very gently, Okay! Done! That’s it. How simple is that? Enjoy with your main dish or just this alone. You will surely love it and it is good for you. 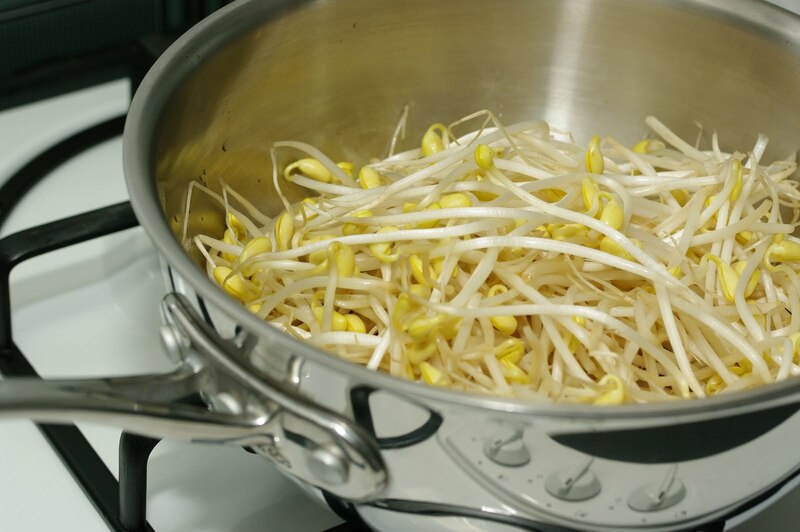 Place bean sprouts in a pot with 1/4 cup of water, cover the lid and set your time for 8 minutes. Cook on medium heat first until steam comes out, then turn the heat to low and continue to cook until time is off. Do not open the lid until done. 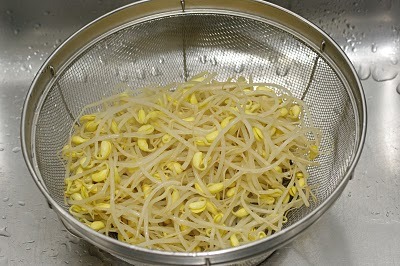 Drain the sprouts in a strainer and let them cool down a bit. Place them in a mixing bowl and add the rest of the ingredients. Toss them well adjusting seasoning as you like. I LOVE this blog! Your pictures are AMAZING! 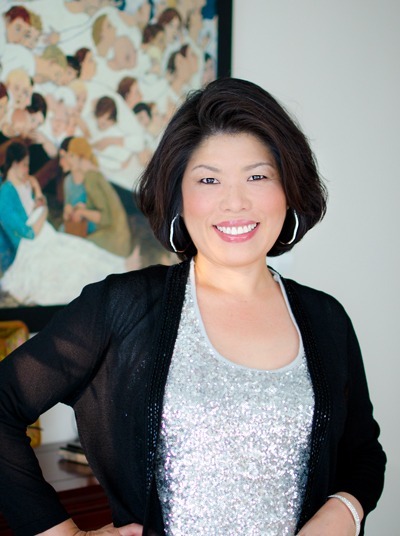 I'm bookmarking you and look forward to seeing many more recipes. I actually am making my very first attempt at sprouting bean sprouts at this very moment - I'll let you know how it goes. I love them, but don't like driving 20 miles to the nearest Korean market to buy them. I hope your recipe turns out better than the way I usually prepare them - they taste okay, but not KOREAN, if you know what I mean... I usually use dashida (I know - you're cringing as you read that!). Keep the recipes coming Holly!! 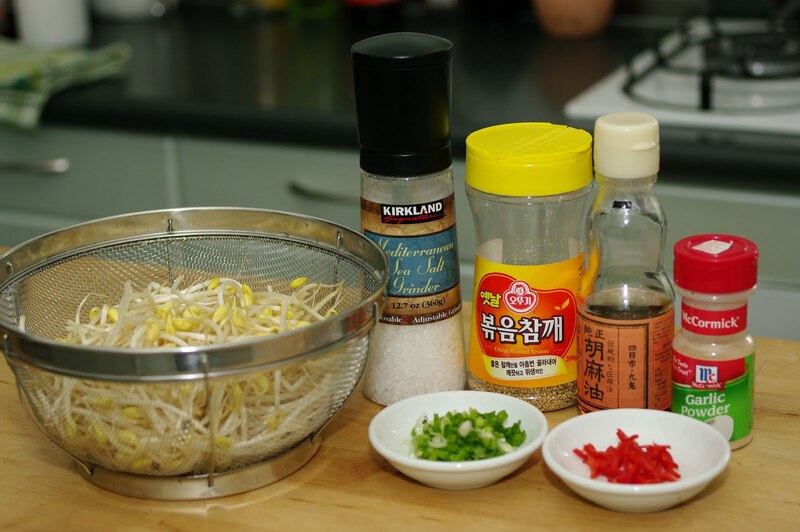 You'll make a true Korean chef out of me after all! Your blog is wonderful! I'm going to follow it and try all your recipes. You're such a great cook! Thanks. Let me know how you like it. Thanks for your namul recipes! I love Korean food always wanted to try making various namul at home, but never found recipes that I like. I shall try your recipes since they don't require too many ingredients, and are basic ingredients found in most homes. 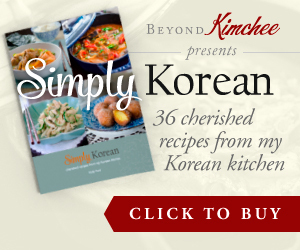 I love Korean food and I always visit your site for Korean recipes. My family specially love the Gabi Jjim and it's always requested when we have get together. I want to try your side dishes, If I want to make lots of it to store (just like what I see in Korean Dramas) how long can it last good in the fridge? Hi Tamy The storage life of side dishes is depending on the ingredients. Fresh vegetable side dishes will last about 1 week in the fridge, cabbage kimchi will last 2-3 month (but still usable afterward), radish kimchi is about 1 month, dried goods (beans, fish, etc) are about 1 month. Salad type last just a couple of days. Kimchi-s will last fresh longer if stored in kimchi refrigerator. I loved the salad! Thank you so much for the great easy to make and delicious recipe! 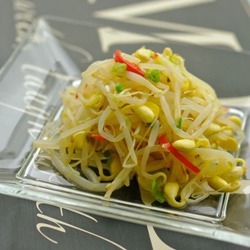 Hi Holly I come from Vietnam where definitely be familiar with green bean sprout, however one day I came to KingBBQ restaurant and ate panchan made with soybean sprout. I was totally amazing that it is more crunchy and sweet. 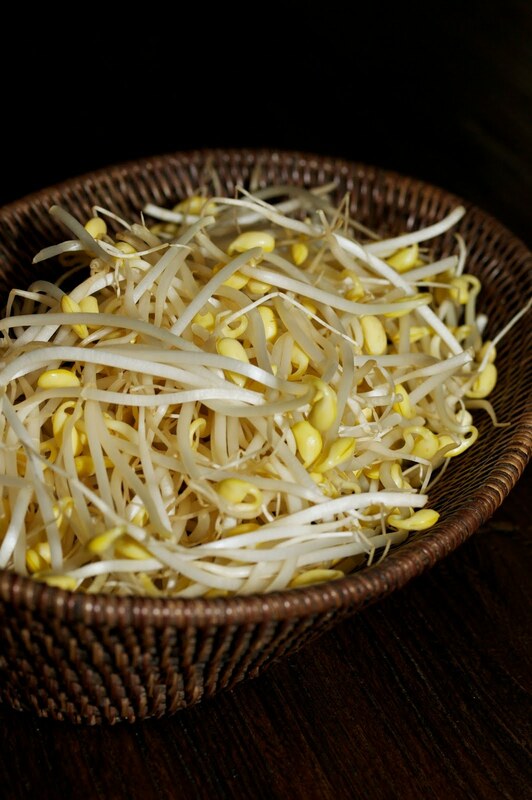 After that day I have been trying to make bean sprout with soy bean but never being successful. Hope someday you can write how to make it at home. I make this salad all the time. Love it!!!! Goes with a lot of dishes.